Shop for joint supplements to treat your dog's degenerative joint disease at VetDepot.com. A dog's joints undergo a lot of wear and tear over the course of his life. Injuries, obesity, anatomical abnormalities, and advancing age can all contribute to the damage. Whether your dog has been diagnosed with joint disease or you are simply looking for a way to maximize his mobility, learning about canine joint health only makes sense. "Many pets suffering from degenerative joint disease benefit from weight loss, physical therapy, massage, cold laser treatments, acupuncture, and stem cell regenerative therapy." Veterinarians can usually diagnose degenerative joint disease based on a dog's age, history of any musculoskeletal injuries or developmental diseases, a physical exam, and x-rays of the joints in question. Getting an accurate diagnosis is important because other diseases that require different forms of treatment can have symptoms that are very similar to those seen with osteoarthritis. Many treatment options for DJD are available, and your vet can help you determine which is best for your dog. Non-steroidal anti-inflammatory drugs (NSAIDs), for example Rimadyl or Deramaxx, are commonly prescribed because of their anti-inflammatory and pain relieving properties. 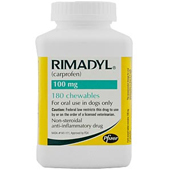 Other pain relievers may be used in conjunction with or in place of NSAIDs if a dog needs more aggressive pain relief or suffers from unacceptable side effects of NSAID use. Some dog foods now even contain one or more of the ingredients listed above. If oral supplements don't seem to be working, an injectable product called Adequan contains an active ingredient similar to glucosamine, which seems to be more effective for some individuals. Many pets suffering from degenerative joint disease benefit from weight loss, physical therapy, massage, cold laser treatments, acupuncture, and stem cell regenerative therapy. In most cases, combination therapy, for example using an NSAID, nutritional supplement and acupuncture together, does a better job than any one therapy alone. DJD is a progressive disease and as such, treatment plans that work initially may need to be "tweaked" as a dog's condition worsens over time. If all else fails, surgery to remove or replace a severely damaged joint may be the best option. 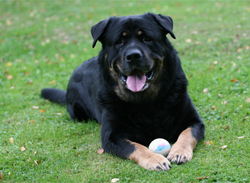 Completely preventing arthritis is usually not possible if a dog has enough risk factors, but owners can do a lot to delay its onset and slow its progression. Keep your dog slim and in good shape. Excess body fat puts extra stress on joints and may contribute to the development of DJD in other ways as well. Strong muscles, tendons and ligaments all help to support joints. Pet medications are very safe and can be given to dogs over long periods of time without worry. Therefore, you do not have to wait until your dog is showing symptoms of DJD to start him on one of these formulations. Many products combine several active ingredients. 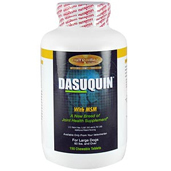 For example, Dasuquin contains glucosamine, chondroitin, and ASU. If after a month or so, you are not pleased with your dog's response to one brand of joint protectant, try a different manufacturer's product.